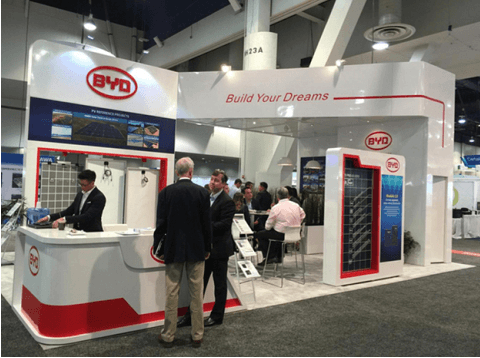 BYD Company Ltd., one of the world’s leaders in energy storage, introduced new home- and grid-tied "Energy + Solar = Zero Emissions" Vision and Products at the 2016 Solar Power International held this week in Las Vegas. The company’s comprehensive renewable power proposition was first launched at the 2016 Intersolar Europe in Munich this June. Visitors to SPI saw two types of BYD solar modules: the Multiple Busbar (MBB) and 4 Busbar modules with 60 or 72 cells; and several Energy Storage solutions including 40-ft container ESS, miniHome ESS and the BYD B-BOX system. BYD currently has more than 60% market share for frequency regulation energy storage in the US. BYD’s “Energy + Solar = Zero Emissions" solutions aim to break through the traditional bottleneck of photovoltaic power generation, so that PV projects meet more diverse market needs and allow for new growth potential in the renewable energy industry. The global PV industry has been developing rapidly in recent years, but there are a number of remaining challenges in production capacity and reliability, as well as in market trends and public policies. In terms of power production, BYD’s Solutions are designed such that the energy generated through PV goes first into energy storage equipment, in order to resolve instabilities in energy flow and improve distribution. This represents a breakthrough for power plant owners to be able to provide more diverse services to a wider variety of customers. In concept, the idea of combining PV generation with energy storage is not new, but BYD is the first to do so with an Iron-Phosphate battery, and is the only company to make both photovoltaic and energy storage products. BYD’s solution is able to provide the best possible value and experience to fulfill its customers solar and energy storage needs.